The powered loudspeakers offered by Schertler are developped for use with Schertler pickups and preamps (PRE-A II). 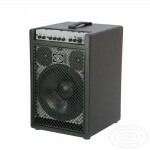 This speaker cabinets have only a power amp unit with volume control and no preamp/EQ, so an external preamp is a must. The Unico and David amps are specially designed for use with the Schertler StatB and DynB Pickups; no external Schertler-preamp is needed. The Side and Bass are powered extension speakers for use with David and Unico.